Hawrami (هەورامی; Hewramî) also known as Avromani, Awromani or Owrami, is one of the main groups of dialects of the Gorani language, a subgroup of Northwestern Iranian languages. 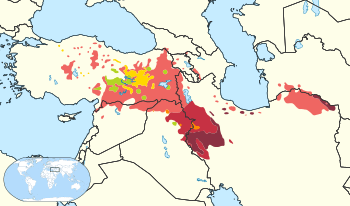 Like all other Gorani dialects, it has some phonological features which distinguish it from Kurdish dialects, though it is surrounded by Kurdish dialects and has been affected by them. It is regarded as the most archaic of the Gorani group. Several Zazaki scholars regard Hawrami as one of the oldest dialects of the Goran–Zaza languages. Some scholars claim that the name Hawrami has close links to the "Zoroastrian faith" and assert that the name actually originated from God's name in Avesta, Ahuraman, (see Ahura Mazda). According to a survey carried out by the Summer Institute of Linguistics in 1996 there were 200,000 speakers of Horami in the world. It is mostly spoken in the Hawraman region, a mountainous region located in western Iran (Iranian Kurdistan) and northeastern Iraq (Iraqi Kurdistan). The key cities of this region are Pawe in Iran and Halabja in Iraq. Hawrami is sometimes called Auramani or Horami by people foreign to the region. Generally, the majority of Hawrami speakers can also speak Sorani Kurdish, and Arabic or Persian, in order to communicate with other people in neighboring cities. Both the Dersim (Zazaki) people and the Gorani, adhere to a form of Yazdanism. These people are called under the various names, such as Ali-Ilahis and Ahl-e Haqq. Groups with similar beliefs also exist in all parts of Kurdistan. ↑ Hammarström, Harald; Forkel, Robert; Haspelmath, Martin; Bank, Sebastian, eds. (2016). "Hawraman-I Luhon". Glottolog 2.7. Jena: Max Planck Institute for the Science of Human History. ↑ Hammarström, Harald; Forkel, Robert; Haspelmath, Martin; Bank, Sebastian, eds. (2016). "Hawraman-I Taxt". Glottolog 2.7. Jena: Max Planck Institute for the Science of Human History. ↑ "THE KURDISH PEOPLES". Retrieved 2 July 2013.